In 1770 a British expedition under the command of then-Lieutenant James Cook made the first voyage by Europeans along the Australian east coast. On 29 April Cook and a small landing party fired on a group of Dharawal people who sought to prevent the British from landing near their camp at Botany Bay, described by Cook as "a small village". Two Dharawal men made threatening gestures and a stone was thrown to underline that the whites were not welcome to land at that spot. Cook then ordered "a musket to be fired with small-shot" and the elder of the two was hit in a leg. This caused the two Dharawal men to run to their huts and seize their spears and shields. Subsequently, a single spear was thrown at the whites which "happily hurt nobody". This then caused Cook to order "a third musket with small-shots" to be fired, "upon which one of them threw another lance and both immediately ran away." Cook did not make further contact with the Dharawal. Cook, in his voyage up the east coast of Australia, observed no signs of agriculture or other development by its inhabitants. Some historians argue that under prevailing European law such land was deemed terra nullius or land belonging to nobody or land 'empty of inhabitants' (as defined by Emerich de Vattel). Cook wrote that he formally took possession of the east coast of New Holland on 22 August 1770 when on Possession Island off the west coast of Cape York Peninsula. The British Government decided to establish a prison colony in Australia in 1786. Under the European legal doctrine of terra nullius, Indigenous Australians were not recognised as having property rights and territory could be acquired through 'original occupation' rather than conquest or consent. The colony's Governor, Captain Arthur Phillip, was instructed to "live in amity and kindness" with Indigenous Australians and sought to avoid conflict. The British settlement of Australia commenced with the First Fleet in mid-January 1788 in the south-east in what is now the federal state of New South Wales. This process then continued into Tasmania and Victoria from 1803 onward. Since then the population density of white people has remained highest in this section of the Australian continent. However, conflict with Aborigines was never as intense and bloody in the south-eastern colonies as in Queensland and the north-east of the continent. More settlers as well as Indigenous Australians were killed on the Queensland frontier than in any other Australian colony. The reason is simple, and is reflected in all evidence and sources dealing with this subject: There were more Aborigines in Queensland. The territory of Queensland was the single most populated section of pre-contact Indigenous Australia, reflected not only in all pre-contact population estimates, but also in the mapping of pre-contact Australia (see Horton's Map of Aboriginal Australia). The indigenous population distribution illustrated below is based on two independent sources, firstly on two population estimates made by anthropologists and a social historian in 1930 and in 1988, secondly on the basis of the distribution of known tribal land. The Distribution of the Pre-Contact Indigenous Population when Imposed on the Current Australian States and Territories. All evidence suggests that the territory of Queensland had a pre-contact Indigenous population density more than double that of New South Wales, at least six times that of Victoria and at least twenty times that of Tasmania. Equally there are signs that the population density of Indigenous Australia was comparatively higher in the north-eastern sections of New South Wales, and along the northern coast from the Gulf of Carpentaria and westward including certain sections of the Northern Territory and Western Australia. Estimated Minimum Indigenous Population by 1788 (based on Prentis 1988). The effects of disease, infertility,[clarification needed] loss of hunting grounds, and starvation on the Aboriginal population were significant. There are indications that smallpox epidemics may have impacted heavily on some Aboriginal tribes, with depopulation in large sections of what is now Victoria, New South Wales and Queensland up to 50% or more, even before the move inland from Sydney of squatters and their livestock. Other diseases hitherto unknown in the Indigenous population—such as the common cold, flu, measles, venereal diseases and tuberculosis—also had an impact, significantly reducing their numbers and tribal cohesion, and so limiting their ability to adapt to or resist invasion and dispossession. According to the historian John Connor, traditional Aboriginal warfare should be examined on its own terms and not by definitions of war derived from other societies. Aboriginal people did not have distinct ideas of war and peace, and traditional warfare was common, taking place between groups on an ongoing basis, with great rivalries being maintained over extended periods of time. The aims and methods of traditional Aboriginal warfare arose from their small autonomous social groupings. The fighting of a war to conquer enemy territory was not only beyond the resources of any of these Aboriginal groupings, it was contrary to a culture that was based on spiritual connections to a specific territory. Consequently, conquering another group's territory may have been seen to be of little benefit. Ultimately, traditional Aboriginal warfare was aimed at continually asserting the superiority of one's own group over its neighbours, rather than conquering, destroying or displacing neighbouring groups. As the explorer Edward John Eyre observed in 1845, whilst Aboriginal culture was "so varied in detail", it was "similar in general outline and character", and Connor observes that there were sufficient similarities in weapons and warfare of these groups to allow generalisations about traditional Aboriginal warfare to be made. In 1840, the American-Canadian ethnologist Horatio Hale identified four types of Australian Aboriginal traditional warfare; formal battles, ritual trials, raids for women, and revenge attacks. Formal battles involved fighting between two groups of warriors, which ended after a few warriors had been killed or wounded, due to the need to ensure the ongoing survival of the groups. Such battles were usually fought to settle grievances between groups, and could take some time to prepare. Ritual trials involved the application of customary law to one or more members of a group who had committed a crime such as murder or assault. Weapons were used to inflict injury, and the criminal was expected to stand their ground and accept the punishment. Some Aboriginal men had effective property rights over women and raids for women were essentially about transferring property from one group to another to ensure the survival of a group through women's food-gathering and childbearing roles. The final type of Aboriginal traditional warfare described by Hale was the revenge attack, undertaken by one group against another to punish the group for the actions of one of its members, such as a murder. In some cases these involved sneaking into the opposition camp at night and silently killing one or more members of the group. duration, due to social groups needing to regularly hunt and forage for food. Traditional Aboriginal warfare was also universal, as the entire community participated in warfare, boys learnt to fight by playing with toy melee and missile weapons, and every initiated male became a warrior. Women were sometimes participants in warfare as warriors and as encouragers on the sidelines of formal battles, but more often as victims. While the selection and design of weapons varied from group to group, Aboriginal warriors used a combination of melee and missile weapons in traditional warfare. Spears, clubs and shields were commonly used in hand-to-hand fighting, with different types of shields favoured during exchanges of missiles and in close combat, and spears (often used in conjunction with spear throwers), boomerangs and stones used as missile weapons. Available weapons had a significant influence over the tactics used during traditional Aboriginal warfare. The limitations of spears and clubs meant that surprise was paramount during raids for women and revenge attacks, and encouraged ambushing and night attacks. These tactics were offset by counter-measures such as regularly changing campsites, being prepared to extinguish camp-fires at short notice, and posting parties of warriors to cover the escape of raiders. Initial peaceful relations between Indigenous Australians and Europeans began to be strained several months after the First Fleet established Sydney on 26 January 1788. The local Indigenous people became suspicious when the British began to clear land and catch fish, and in May 1788 five convicts were killed and an Indigenous man was wounded. The British grew increasingly concerned when groups of up to three hundred Indigenous people were sighted at the outskirts of the settlement in June. Despite this, Phillip attempted to avoid conflict, and forbade reprisals after being speared in 1790. He did, however, authorise two punitive expeditions in December 1790 after his huntsman was killed by an Indigenous warrior named Pemulwuy, but neither was successful. During the 1790s and early 19th century the British established small settlements along the Australian coastline. These settlements initially occupied small amounts of land, and there was little conflict between the settlers and Indigenous peoples. Fighting broke out when the settlements expanded, however, disrupting traditional Indigenous food-gathering activities, and subsequently followed the pattern of European settlement in Australia for the next 150 years. Indeed, whilst the reactions of the Aboriginal inhabitants to the sudden arrival of British settlers were varied, they became inevitably hostile when their presence led to competition over resources, and to the occupation of their lands. European diseases decimated Indigenous populations, and the occupation or destruction of lands and food resources sometimes led to starvation. By and large neither the Europeans nor the Indigenous peoples approached the conflict in an organised sense, with the conflict more one between groups of settlers and individual tribes rather than systematic warfare, even if at times it did involve British soldiers and later formed mounted police units. Not all Indigenous Australians resisted white encroachment on their lands either, whilst many also served in mounted police units and were involved in attacks on other tribes. Settlers in turn often reacted with violence, resulting in a number of indiscriminate massacres. European activities provoking significant conflict included pastoral squatting and gold rushes. Opinions differ on whether to depict the conflict as one-sided and mainly perpetrated by Europeans on Indigenous Australians or not. Although tens of thousands more Indigenous Australians died than Europeans, some cases of mass killing were not massacres but quasi-military defeats, and the higher death toll was also caused by the technological and logistic advantages enjoyed by Europeans. Indigenous tactics varied, but were mainly based on pre-existing hunting and fighting practices—utilising spears, clubs and other simple weapons. Unlike the indigenous peoples of New Zealand and North America, in the main they failed to adapt to meet the challenge of the Europeans, and although there were some instances of individuals and groups acquiring and using firearms, this was not widespread. In reality the Indigenous peoples were never a serious military threat, regardless of how much the settlers may have feared them. On occasions large groups attacked Europeans in open terrain and a conventional battle ensued, during which the Aborigines would attempt to use superior numbers to their advantage. This could sometimes be effective, with reports of them advancing in crescent formation in an attempt to outflank and surround their opponents, waiting out the first volley of shots and then hurling their spears whilst the settlers reloaded. Usually, however, such open warfare proved more costly for the Indigenous Australians than the Europeans. Central to the success of the Europeans was the use of firearms, but the advantages this afforded have often been overstated. Prior to the 19th century, firearms were often cumbersome muzzle-loading, smooth-bore, single shot weapons with flint-lock mechanisms. Such weapons produced a low rate of fire, whilst suffering from a high rate of failure and were only accurate within 50 metres (160 ft). These deficiencies may have given the Aborigines some advantages, allowing them to move in close and engage with spears or clubs. However, by 1850 significant advances in firearms gave the Europeans a distinct advantage, with the six-shot Colt revolver, the Snider single shot breech-loading rifle and later the Martini-Henry rifle as well as rapid-fire rifles such as the Winchester rifle, becoming available. These weapons, when used on open ground and combined with the superior mobility provided by horses to surround and engage groups of Indigenous Australians, often proved successful. The Europeans also had to adapt their tactics to fight their fast-moving, often hidden enemies. Strategies employed included night-time surprise attacks, and positioning forces to drive the Aborigines off cliffs or force them to retreat into rivers while attacking from both banks. Fighting between Indigenous Australians and European settlers was localised, as Indigenous groups did not form confederations capable of sustained resistance. Conflict emerged as a series of violent engagements, and massacres across the continent. According to the historian Geoffrey Blainey, in Australia during the colonial period: "In a thousand isolated places there were occasional shootings and spearings. Even worse, smallpox, measles, influenza and other new diseases swept from one Aboriginal camp to another ... The main conqueror of Aborigines was to be disease and its ally, demoralisation". The Caledon Bay crisis of 1932–4 saw one of the last incidents of violent interaction on the 'frontier' of indigenous and non-indigenous Australia, which began when the spearing of Japanese poachers who had been molesting Yolngu women was followed by the killing of a policeman. As the crisis unfolded, national opinion swung behind the Aboriginal people involved, and the first appeal on behalf of an Indigenous Australian, Dhakiyarr Wirrpanda, was launched to the High Court of Australia in Tuckiar v the King. Following the crisis, the anthropologist Donald Thomson was despatched by the government to live among the Yolngu. Elsewhere around this time, activists like Sir Douglas Nicholls were commencing their campaigns for Aboriginal rights within the established Australian political system and the age of frontier conflict closed. Frontier encounters in Australia were not universally negative. Positive accounts of Aboriginal customs and encounters are also recorded in the journals of early European explorers, who often relied on Aboriginal guides and assistance: Charles Sturt employed Aboriginal envoys to explore the Murray-Darling; the lone survivor of the Burke and Wills expedition was nursed by local Aborigines, and the famous Aboriginal explorer Jackey Jackey loyally accompanied his ill-fated friend Edmund Kennedy to Cape York. Respectful studies were conducted by such as Walter Baldwin Spencer and Frank Gillen in their renowned anthropological study The Native Tribes of Central Australia (1899); and by Donald Thomson of Arnhem Land (c.1935–1943). In inland Australia, the skills of Aboriginal stockmen became highly regarded. An illustration of the explorer Charles Sturt's party being "threatened by blacks at the junction of the Murray and Darling, 1830", near Wentworth, New South Wales. The first British settlement in Western Australia was established by the British Army at Albany in 1826. Relations between the garrison and the local Minang people were generally good. Open conflict between Noongar and European settlers broke out in Western Australia in the 1830s as the Swan River Colony expanded from Perth. The Pinjarra Massacre is the best known single event, it occurred on 28 October 1833 when a party of British soldiers and mounted police led by Governor Stirling attacked an Indigenous campsite on the banks of the Murray River. The Noongar people forced from traditional hunting grounds and denied access to sacred sites turned to stealing settlers crops and killing livestock to supplement their food supply. In 1831 a Noongar person was killed taking potatoes; this resulted in Yagan killing a servant of the household as was the response permitted under tribal law. In 1832 Yagan and two others were arrested and sentenced to death, settler Robert Menli Lyon argued that Yagan was defending his land from invasion as such he should be treated as a prisoner of war. The argument was successful and the three men were exiled to Carnac Island under the supervision of Lyon and two soldiers. The group later escaped from the island. In the Vasse region relations between the white settlers and the native Wardandi people were strained to the point of violence, resulting in several Aboriginal deaths. In June 1841, George Layman was speared to death by Wardandi elder Gaywal. According to one source, Layman had gotten involved in an argument between Gaywal and another Wardandi tribesman over their allocation of damper, and pulled Gaywal's beard, which was considered a grave insult. According to another source, Layman had hired two of Gaywal's wives to work on his farm and would not let them go back to their husband. A manhunt for Layman's killer went on for several weeks, involving much bloodshed as Captain Molloy, the Bussell brothers, and troops killed unknown numbers of Aboriginals in what has become known as the Wonnerup Massacre. The posse eventually shot Gaywal and captured his three sons, two of whom were imprisoned on Rottnest Island. Considerable fighting also took place in South Australia between 1839 and 1841. Fighting also took place in early pre-separation Victoria after it was settled in 1834. In 1833–34, the battle for rights to a beached whale between whalers and the Gunditjmara resulted in the Convincing Ground massacre near Portland, Victoria. A clash at Benalla in 1838 known as the Battle of Broken River of which at least seven white settlers were killed, marked the beginning of frontier conflict in the colony which lasted for fifteen years. In 1839 the reprisal raid against Aboriginal resistance in central Victoria resulted in the Campaspe Plains massacre. The Indigenous groups in Victoria concentrated on economic warfare, killing tens of thousands of sheep. Large numbers of British settlers arrived in Victoria during the 1840s, and rapidly outnumbered the Indigenous population. From 1840, the Eumerella Wars raged in south west Victoria, and many years of violence occurred during the Warrigal creek and Gippsland massacres. In the late 1840s, frontier conflict continued in the Wimmera. The frontier wars were particularly bloody and bitter in Queensland, owing to its comparatively large Indigenous population. This point is emphasised in a 2011 study by Orsted-Jensen, which by use of two different sources calculated that colonial Queensland must have accounted for upwards of one third and close to forty percent of the indigenous population of the pre-contact Australian continent. Queensland represents the single bloodiest colonial frontier in Australia. Thus the records of Queensland document the most frequent reports of shootings and massacres of indigenous people, the three deadliest massacres on white settlers, the most disreputable frontier police force, and the highest number of white victims to frontier violence on record in any Australian colony. In 2009 professor Raymond Evans calculated the indigenous fatalities caused by the Queensland Native Police Force alone as no less than 24,000. In July 2014, Evans, in cooperation with the Danish historian Robert Ørsted-Jensen, presented the first-ever attempt to use statistical modelling and a database covering no less than 644 collisions gathered from primary sources, and ended up with total fatalities suffered during Queensland's frontier wars being no less than 66,680—with Aboriginal fatalities alone comprising no less than 65,180—whereas the hitherto commonly accepted minimum overall continental deaths had previously been 20,000. The 66,680 covers Native Police and settler-inflicted fatalities on Aboriginal people, but also a calculated estimate for Aboriginal inflicted casualties on the invading forces of whites and their associates. The continental death toll of Europeans and associates has previously been roughly estimated as between 2,000 and 2,500, yet there is now evidence that Queensland alone accounted for an estimated 1,500 of these fatal frontier casualties. The invasion of what is now Queensland commenced as the Moreton Bay penal settlement from September 1824. It was initially located at Redcliffe but moved south to Brisbane River a year later. Free settlement began in 1838 but a wholesale invasion and settlement only really began with the great rush to take up the surrounding land in the Darling Downs, Logan and Brisbane Valley and South Burnett onwards from 1840, in many cases leading to widespread fighting and heavy loss of life. The conflict later spread north to the Wide Bay and Burnett River and Hervey Bay region, and at one stage the settlement of Maryborough was virtually under siege. Both sides committed atrocities, with settlers poisoning a large number of Indigenous people, for example at Kilcoy on the South Burnett in 1842 and on Whiteside near Brisbane in 1847, and Indigenous warriors killing 19 settlers during the Cullin-La-Ringo massacre on 17 October 1861. Queensland's Native Police Force was formed by the Government of New South Wales in 1848, under the well connected Commandant Frederick Walker. The largest reasonably well documented massacres in south east Queensland were the Kilcoy and Whiteside poisonings, each of which was said to have taken up to 70 Aboriginal lives by use of gift of flour laced with strychnine. Central Queensland was particularly hard hit during the 1860s and 1870s, several contemporary settlers mention the "Skull Hole" or Mistake Creek massacre on Bladensburg station near Winton which in 1901 was said to have taken up to 200 Aboriginal lives. In 1869 the Port Denison Times reported that "Not long ago 120 aboriginals disappeared on two occasions forever from the native records" Frontier violence peaked on the northern mining frontier during the 1870s, most notably in Cook district and on the Palmer and Hodgkinson River goldfields, with heavy loss of Aboriginal lives and several well known massacres. Battle Camp and Cape Bedford belong among the best known massacres of Aboriginal people in Cook district, but they were certainly not the only ones. The Cape Bedford massacre on 20 February 1879 alone was reported to have taken as many as 28 lives, this was retaliation for the injuring (but not killing) of two white "ceder-getters" from Cooktown. In January 1879 Carl Feilberg, the editor of the short lived Brisbane Daily News (later editor-in-chief of the Brisbane Courier), conveyed a report from a "gentleman, on whose words reliance can be placed" that he had after just "one of these raids...counted as many as seventy-five natives dead or dying upon the ground." Raids conducted by the Kalkadoon held settlers out of Western Queensland for ten years until September 1884 when they attacked a force of settlers and native police at Battle Mountain near modern Cloncurry. The subsequent battle of Battle Mountain ended in disaster for the Kalkadoon, who suffered heavy losses. Fighting continued in north Queensland, however, with Indigenous raiders attacking sheep and cattle while native police mounted punitive expeditions. Two reports from 1884 and 1889 written by one of the prime combatants of the Kalkadoons, Sub-inspector of Native Police (later Queensland Police Commissioner) Frederic Charles Urquhart described how he and his detachment pursued and killed up to 150 Aborigines in just three or four so-called "dispersals" (he provided numbers up to about 80 of these killings, the rest was just described without estimating the actual toll). The conflict in Queensland was the bloodiest in the history of Colonial Australia. 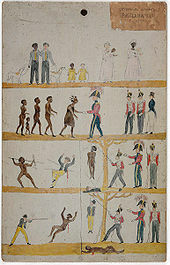 The latest studies gives evidence of some 1,500 whites and associates (meaning Aboriginal servants, as well as Chinese, Melanesian and other non-Europeans) killed on the Queensland frontier during the 19th century, while some recent studies suggest that upwards of 65,000 Aborigines were killed, with sections of Central and North Queensland witnessing particularly heavy fighting. The figure of 65,000 is considerably higher than the common national minimum of 20,000 colonial Aboriginal casualties. The British made three early attempts to establish military outposts in northern Australia. The initial settlement at Fort Dundas on Melville Island was established in 1824 but was abandoned in 1829 due to attacks from the local Tiwi people. Some fighting also took place near Fort Wellington on the Cobourg Peninsula between its establishment in 1827 and abandonment in 1829. The third British settlement, Fort Victoria, was also established on the Cobourg Peninsula in 1838 but was abandoned in 1849. The final battles took place in the Northern Territory. A permanent settlement was established at modern-day Darwin in 1869 and attempts by pastoralists to occupy Indigenous land led to conflict. This fighting continued into the 20th century, and was driven by reprisals against European deaths and the pastoralists' desire to secure their land. At least 31 Indigenous men were killed by police in the Coniston massacre in 1928 and further reprisal expeditions were conducted in 1932 and 1933. Armed resistance to British settlement was generally given little attention by historians until the 1970s, and was not regarded as a "war". In 1968 anthropologist W.E.H. Stanner wrote that historians' failure to include Indigenous Australians in histories of Australia or acknowledge widespread frontier conflict constituted a 'great Australian silence'. Works which discussed the conflicts began to appear during the 1970s and 1980s, and the first history of the Australian frontier told from an Indigenous perspective, Henry Reynolds' The Other Side of the Frontier, was published in 1982. Between 2000 and 2002 Keith Windschuttle published a series of articles in the magazine Quadrant and the book The Fabrication of Aboriginal History. These works argued that there had not been prolonged frontier warfare in Australia, and that historians had in some instances fabricated evidence of fighting. Windschuttle's claims led to the so-called "history wars" in which historians debated the extent of the conflict between Indigenous Australians and European settlers. ^ Connor, John (2002). The Australian Frontier Wars, 1788-1838. p. XII. ISBN 9780868407562. ^ Coates (2006), p. 12. ^ a b Grey (2008), p. 39. ^ Williams 1997, p. 95. ^ a b Macintyre (1999), p. 34. ^ Knop (2002), p. 128. ^ Beaglehole, J.C. (1955). The Journals of Captain James Cook, Vol.1. Cambridge: Hakluyt Society. p. 387. ISBN 0851157440. ^ Macintyre (1999), p. 30. ^ Broome (1988), p. 93. ^ "Map of Aboriginal Australia « Australian Indigenous HealthInfoNet". ecu.edu.au. Retrieved 23 September 2016. ^ Robert Ørsted-Jensen: Frontier History Revisited – Colonial Queensland and the History War (Brisbane 2011), chapter 1, page 6-15. ^ Statistics compiled by Ørsted-Jensen for Frontier History Revisited (Brisbane 2011), page 10-11 & 15. Column one is the distribution percentage calculated on the estimates gathered and publicised in 1930 (Official Year Book of the Commonwealth of Australia XXIII, 1930, pp 672, 687-696) by the social anthropologist Alfred Radcliffe-Brown. The percentage in column two was calculated on the basis of N.G. Butlin: Our Original Aggression and ‘others’, by M. D. Prentis for his book A Study in Black and White (2 revised edition, Redfern NSW 1988, page 41). Column three however, is calculated on the basis of the 'Aboriginal Australia’ map, published by Australian Institute of Aboriginal and Torres Strait Islander Studies (AIATSIS), Canberra 1994. ^ Statistics compiled by Ørsted-Jensen for Frontier History Revisited (Brisbane 2011), page 10-11 & 15, see more in ref above. ^ Statistics compiled by Ørsted-Jensen for Frontier History Revisited (Brisbane 2011), page 15. The figures and percentage in column two was calculated on the basis of N.G. Butlin: Our Original Aggression and ‘others’, by M. D. Prentis for his book A Study in Black and White (2 revised edition, Redfern NSW 1988, page 41). ^ Dennis et al. (1995), p. 11. ^ Connor (2002), pp. 2–3. ^ Connor (2002), pp. 3–4. ^ a b c Connor (2002), p. 4. ^ Connor (2002), pp. 5–8. ^ Connor (2002), pp. 4–5. ^ Connor (2002), pp. 8–12. ^ Connor (2002), pp. 12–13. ^ Broome (1988), p. 94. ^ Macintyre (1999), p. 33. ^ Connor (2002), pp. 31–33. ^ a b Kohen, J. L. (2005). "Pemulwuy (c. 1750 – 1802)". Australian Dictionary of Biography. Australian National University. Retrieved 12 July 2009. ^ Connor (2002), pp. 33–34. ^ a b Dennis et al. (1995), p. 9. ^ a b Dennis et al. (1995), p. 12. ^ Grey (1999), p. 31. ^ Dennis et al. (1995), p. 5. ^ Grey (1999), p. 30. ^ Dennis et al. (1995), pp. 12–13. ^ Dennis et al. (1995), pp. 7–8. ^ Macintyre (1999), p. 62. ^ Blainey (2003), p. 313. ^ Egan, Ted (1996). Justice All Their Own. ISBN 0522846939. ^ Tom Murray; Allan Collins (2004). "Dhakiyarr vs the King". Film Australia. Archived from the original on 14 August 2014. ^ Tuckiar v The King  HCA 49, (1934) 52 CLR 335, High Court. ^ Dewar, Mickey (2005). "Dhakiyarr Wirrpanda (1900–1934)". Australian Dictionary of Biography. Australian National University. Retrieved 29 July 2014. ^ "The Wave Hill 'walk-off' – Fact sheet 224". National Archives of Australia. Retrieved 23 September 2016. ^ Macintyre (1999), p. 38. ^ a b c d e f g Connor (2008), p. 220. ^ Text of Proclamation ending Martial Law at National Library of Australia. ^ "Bells Falls Gorge – virtual tour". National Museum of Australia. Retrieved 23 September 2016. ^ Sir Thomas Brisbane to Earl Bathurst, Despatch No.18 per ship Mangles,Government House, N.S. Wales, 31 December 1824. ^ Connor (2008), p. 62. ^ Broome (1988), p. 101. ^ "Governor Arthur's proclamation". National Treasures from Australia's Great Libraries. National Library of Australia. Archived from the original on 28 October 2010. Retrieved 5 November 2010. ^ Broome (1988), p. 96. ^ Hasluck, Alexandra (1967). "Yagan ( – 1833)". Australian Dictionary of Biography. Canberra: Australian National University. Retrieved 4 November 2008. ^ a b c Stirling, Ros. "WONNERUP: A chronicle of the south-west". Australian Heritage magazine. Archived from the original on 25 May 2011. Retrieved 21 April 2011. ^ "THE WESTERN AUSTRALIAN JOURNAL". The Perth Gazette and Western Australian Journal. National Library of Australia. 13 March 1841. p. 3. Retrieved 23 April 2011. ^ There are no official records of the massacre and sources suggest anywhere from 5 to 300 were killed. s:History of West Australia by Warren Burt Kimberley, published in 1897, chapter 13, page 116, describes: The black men were killed by the dozens and their corpses lined the route of the march...their bones could still be seen in 1897. However, there is no estimate of nor actual number given in this source. Other, more recent sources quote a number of 250 to 300, though none of these appear to be supported anywhere other than oral history of unknown origin. A newspaper report of the time in "THE WESTERN AUSTRALIAN JOURNAL". The Perth Gazette and Western Australian Journal. National Library of Australia. 13 March 1841. p. 3. Retrieved 23 April 2011. states that only 5 were killed. ^ a b c d e f Connor (2008), p. 221. ^ Broome (1988), pp. 108–109. ^ Broome (1988), pp. 103–104. ^ "THE SETTLERS AND THE BLACKS OF PORT FAIRY. - Southern Australian (Adelaide, SA : 1838 - 1844) - 10 Jun 1842". Trove. Retrieved 4 December 2018. ^ Broome (1988), pp. 102–103. ^ Ørsted-Jensen (2011), pp. 10–11. ^ a b Reynolds (1982), pp. 121–127. ^ a b Reynolds (1987), p. 53. ^ Ørsted-Jensen (2011), pp. 16–20 and Appendix A: Listing the Death Toll of the Invader. ^ Broome (1988), p. 102. ^ Skinner (1975), p. 26. ^ Queenslander 20 April 1901, page 757d-758c and Carl Lumholtz Among Cannibals (London 1889) page 58-59; See also Bottoms 2013, pp. 172–174. ^ Port Denison Times 1 May 1869, page 2g and the Empire (Sydney) 25 May 1869, page 2. ^ Daily News (formerly Queensland Patriot) 1 January 1879, p2f. ^ Coulthard-Clark (2001), pp. 51–52. ^ Queensland State Archives A/49714 no 6449 of 1884 (report); QPG re 13 Jul 1884, Vol 21:213; 21 Jul 1884 – COL/A395/84/5070; Q 16 Aug 1884, p253; 20 Aug 1884 Inquest JUS/N108/84/415; POL/?/84/6449; 15 Queensland Figaro Nov 1884 and Queensland State Archives A/49714, letter 9436 of 1889. ^ Broome (1988), p. 109. ^ "The Aboriginal Memorial". National Gallery of Australia. Retrieved 13 May 2018. ^ Peacock, Matt (26 February 2009). "War memorial battle over frontier conflict recognition". The 7:30 Report. Australian Broadcasting Corporation. Archived from the original on 26 May 2009. Retrieved 18 April 2009. Blainey, Geoffrey (2003). A Short History of the World. Lanham: Ivan R. Dee. ISBN 1461709865. Bottoms, Timothy (2013). Conspiracy of Silence: Queensland's frontier killing times. Sydney: Allen & Unwin. ISBN 978-1-74331-382-4. Broome, Richard (1988). "The Struggle for Australia : Aboriginal-European Warfare, 1770–1930". In McKernan, Michael; Browne, Margaret; Australian War Memorial (eds.). Australia Two Centuries of War & Peace. Canberra, A.C.T. : Australian War Memorial in association with Allen and Unwin, Australia. pp. 92–120. ISBN 0-642-99502-8. Butlin, Noel G. (1983). Our Original Aggression: Aboriginal Populations of Southeastern Australia, 1788–1850. Sydney: Allen & Unwin. ISBN 0868612235. Connor, John (2002). The Australian frontier wars, 1788–1838. Sydney: UNSW Press. ISBN 0-86840-756-9. Connor, John (2008). "Frontier Wars". In Dennis, Peter; et al. (eds.). The Oxford Companion to Australian Military History (Second ed.). Melbourne: Oxford University Press Australia & New Zealand. ISBN 978-0-19-551784-2. Coulthard-Clark, Chris D. (2001). The Encyclopedia of Australia's Battles (Second ed.). Crows Nest, New South Wales: Allen & Unwin. ISBN 1865086347. Peters-Little, Frances; Curthoys, Ann; Docker, John, eds. (3 October 2011). Passionate Histories: Myth, memory and Indigenous Australia. Aboriginal History Monograph. 21. ANU-Press. ISBN 1-921666-64-1. (Estimates of 19th century Aboriginal Frontier death toll, see 'Part One, Massacres' chapter 1, The Country Has Another Past: Queensland and the History Wars by Raymond Evans). Knop, Karen (May 2002). Diversity and Self-Determination in International Law. Cambridge Studies in International and Comparative Law. Cambridge, England: Cambridge University Press. ISBN 978-0-521-78178-7. Retrieved 9 January 2013. Macintyre, Stuart (1999). A Concise History of Australia. Cambridge Concise Histories (First ed.). Cambridge: Cambridge University Press. ISBN 0-521-62577-7. Ørsted-Jensen, Robert (2011). Frontier History Revisited – Queensland and the 'History War'. Cooparoo, Brisbane, Qld: Lux Mundi Publishing. ISBN 9781466386822. Reynolds, Henry (1982). The Other Side of the Frontier: Aboriginal Resistance to the European Invasion of Australia. Ringwood: Penguin Books Australia. ISBN 0140224750. Williams, Glyndwr, ed. (1997). Captain Cooks Voyages 1768–1779. London: Folio Society. OCLC 38549967. Reynolds, Henry (1987). Frontier: Aborigines, Settlers and Land. Sydney: Allen and Unwin. ISBN 0-04-994005-8. Skinner, Leslie E. (1975). Police of the Pastoral Frontier : Native Police, 1849–1859. St. Lucia, Queensland: University of Queensland Press. ISBN 0702209775. Connor, John (October 2017). "Climate, Environment and Australian Frontier Wars: New South Wales 1788-1841". The Journal of Military History. 81 (4): 985–1006. Gapps, Stephen (2018). The Sydney Wars: Conflict in the early colony, 1788-1817. Sydney: NewSouth. ISBN 9781742232140. Loos, Noel A. (1982). Invasion And Resistance: Aboriginal-European Relations On The North Queensland Frontier 1861–1897. Canberra, Australia; Miami, Fl, USA: Australian National University Press. ISBN 0-7081-1521-7. Reynolds, Henry (2013). Forgotten War. Sydney. ISBN 9781742233925. Stanley, Peter (1986). The Remote Garrison: The British Army in Australia 1788–1870. Kenthurst: Kangaroo Press. ISBN 0-86417-091-2. Foster, Robert; Hosking, Rick; Nettleback, Amanda (2001). Fatal Collisions: The South Australian Frontier and the Violence of Memory. Kent Town: Wakefield Press. ISBN 1-86254-533-2.